Hi again! Well I said I’d be posting another something for another event before going too far yes? Ok so here’s the thing… I have an event opening technically tonight at midnight but because I am actually not running behind, late or any other number of words you can use to describe the grind that happens right before events happen I have my stuff all set up already! Wow right? So this round which runs from tonight at midnight for 20 days meaning it ends around the 9th of Dec. I believe I put out a chair set. An addition to a line that I started awhile ago called the Baxter Collection. The piece I had before is a lap dance type thing, quite adult and this piece is more PG friendly. The chair is similar in fashion to the other so they work together very well of course with the same coloring, texturing, and look, the back is shaped a little differently and it’s a prim less on the LI scale too weighing in at 4. The set includes not only the chair, but the planting that is in the other and the black rug that I’ve used to spice up the scene in my store so you can decorate a little bit. The chair itself has 9 male sits in it, 8 female sits in it…. and then 9 couples sets. The couples sets are some very sweet cuddly sorts of things. Nothing adult in this one but I thought it worked. Rounding out the set a small bit, giving something there that can be in anyone’s living room or space. I do have a few other pieces for this that I’m trying to work on too so you never know, might see more in the coming months. This lovely set is available NOW at the main landing to my store because I’m ahead of myself and at a 20% discount. 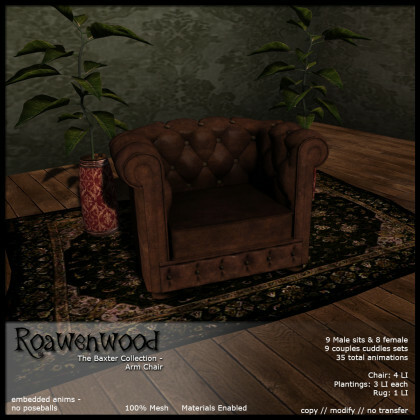 ← Wayward Secrets and Affairs…. err….. New Stuff!